Who you got from here? Surprisingly, my new predicted final of Muguruza-Halep is still alive! 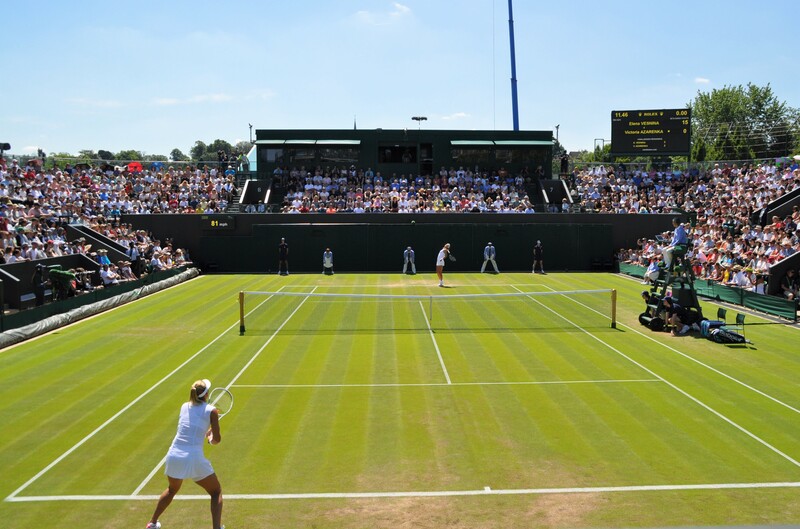 15:50pm: A few more match points go missing but a forehand winner DTL followed by an Azarenka groundstroke wide see Halep break for the win, reaching the Wimbledon quarter-finals for the second straight year, with a 7-6(3) 6-2 victory over Victoria Azarenka. All in all, a good first Slam back for Azarenka who tried to be aggressive but made too many errors from the first set tiebreak onwards. Loved Azarenka’s fight at the end. 15:30pm: Jo’s post-match interview is linked below. I’m hoping it works for those outside of the UK! Jo Konta has dreamt of this since she was a child. 15:23pm: Johanna Konta is into her first Wimbledon quarter-final and my my, that’s an emotional reaction! Well done, Jo! Third set was all on serve but sadly, Garcia blinked at the end with two groundstrokes into the net. Konta through, 7-6(3) 4-6 6-4 in two hours and 11 minutes. Just one match remaining now and Halep is in control now, up a set and a break on Azarenka. 15:18pm: Clutch from Halep to twice come from a break down and then hold at *4-5 and *5-6 from *30-30. In a first set tiebreak, Azarenka produces a stream of unforced errors. Halep sweeps through, who hit a great crosscourt backhand in there too, to win the opener, 7-6(3). 20 unforced errors from Azarenka was a key stat. 15:10pm: It will be CoCo Vandeweghe vs. Magdalena Rybarikova for a place in the semi-finals after CoCo beats Caro, 7-6(4) 6-4. Wozniacki is now 0-6 in last 16 matches at Wimbledon. Winning more points behind her first serve and 22 of 32 up at the net, CoCo was too good on the day. A first set tiebreak is coming in Azarenka-Halep. 15:00pm: Rallies getting a little longer in this one. Halep held with her best service game and some decent serves. Azarenka holds too with ease and Halep will serve to stay in the first set at *4-5. 14:53pm: A few gifts from Azarenka with two shots into the net as Halep breaks back again. Azarenka is yet to to consolidate a break but has looked the more aggressive of the pair so far. Vandeweghe and Wozniacki are tied at 3-3 in the second set. I don’t know if it’s just me but the Wimbledon live scoreboard has been dreadful for me today and is constantly behind. 14:48pm: Garcia does serve out the second set, at the second time of asking, and is going three with Konta on No.1 Court. Azarenka, with a cute drop shot, goes up a break again to lead Halep, 4-2. The Romanian player does not look settled yet with Azarenka in control. 14:40pm: A break apiece on a quiet No.2 Court with Halep getting on the board and now to serve at 1-2 first set. Garcia is trying to serve out the second but encountering some resistance. 14:30pm: Vandeweghe wins the first set against Wozniacki, 7-6(4). A really impressive tiebreak from CoCo who won it up at the net with three gorgeous volleys. Konta-Garcia looks to be heading to a third set with CarGar a double break up in the second set. Five matches down and three left with Halep-Azarenka starting on Court No.2. It all feels a little calmer for now! 14:15pm: We now know that Venus Williams will play Jelena Ostapenko in the quarter-finals. Venus, rather comfortably, defeats Ana Konjuh on Centre Court, 6-3 6-2 in 63 minutes. Cracking stats from Venus. And bring on that QF, can’t wait!!! 14:14pm: Here’s the match point reaction from Muguruza, who gets Kuznetsova in the quarter-finals. This result also confirms that Kerber’s run at world number one will come to an end. For the best with Angie but this was a very encouraging performance and hopefully she can build on this during the summer hard court season. 14:10pm: What a match! Muguruza beats Kerber, 4-6 6-4 6-4 in two hours and 18 minutes. A gritty final game from Muguruza, holding firm on a tricky overhead and then bringing up two match points when Kerber went wide early with a forehand. Kerber gets a good serve in and goes after her backhand to save the first two. Muguruza gets it on the third. Best i’ve seen Kerber play in a long time but I am mega impressed that Muguruza stuck to the gameplan of coming forward, even when it wasn’t working too well in the first set, making 54 net approaches and winning 14 of 19 in the third set. Muguruza came from a break down twice in the final set and saved four break points in what was the pivotal game at 3-3. 14:02pm: Two routine holds and Muguruza leads 5-4 third set on serve against Kerber. A really good service game from Muguruza with some decent defence, a drive volley winner in there and some solid serving. Konta and Garcia are contesting a first set tiebreak after Konta was unable to serve out the set at *5-3. 13:55pm: And it just keeps on getting better and better, Kerber-Muguruza is brilliant right now. Muguruza saves FOUR break points, two with volley winners and two on further aggressive points. The pair share a handful of stunning points with Kerber winning the best of the lot. I’ll try and find a video of it as I cannot even remember/explain it now! Muguruza eventually holds with a stunning point and is looking more assured in her move towards the net and credit to her for sticking with the tactic even when it hasn’t worked at times. Muguruza 4-3 third set on serve. 13:43pm: Muguruza with a gorgeous lob and a drive volley winner to break Kerber straight back. Can’t call this one, it’s a fascinating contest! 3-3 third set Kerber-Muguruza. 13:40pm: Only just now switched to Venus Williams vs. Ana Konjuh where Venus broke and then served out the set in convincing fashion to lead 6-3 first set. Konta’s up a break on Caroline Garcia and Wozniacki and Vandeweghe are underway on No.3 Court. This is just madness!!!! 13:37pm: Kerber breaks again to lead in this compelling contest against Muguruza, leading *3-2 in the 3rd set. Kerber immediately broke with a passing shot winner, but Muguruza got back to level terms at 2-2 with a drive volley winner on break point. Muguruza looking a bit more aggressive right now but some neat variety from Kerber, chucking in a slice in the last point. Muguruza going long twice on the BH, the first on another absorbing rally. Love how both are competing right now and it’s the match of the day so far by a country mile. 13:35pm: Well done, Magdalena Rybarikova! Into a first ever Slam quarter-final with a 6-4 2-6 6-3 win over Petra Martic. 13:26pm: Ostapenko goes on a wander with Svitolina stepping up with a few different balls and better depth. However in a second set tiebreak, still with nerves about, Ostapenko converts on her EIGHTH match point to win, 6-3 7-6(6). A wonderful short-angled backhand winner to set up the 8th MP and then another forceful point. Ostapenko joins Kuznetsova in the quarters. Aljona Ostapenko, 11 Grand Slam matches won in a row. 13:19pm: Steady there… Ostapenko breaks backs and roarsssss! Second set tiebreak against Svitolina is coming. CC and No.1 Court have started and now i’m losing the plot haha! 13:17pm: Gutsy tennis from Muguruza to save break points earlier on in the set and then finally break Kerber for the first time in the match to force a decider. The Spaniard looking more comfortable at the net and hitting well on the BH side. A few loose errors from Kerber in that final game. 6-4 4-6 and into a third set. Meanwhile Ostapenko might be heading that way too with Svitolina mounting a big comeback. Five match points saved and now serving for the second set. 13:15pm: Our first winner of the day and colour me a little surprised that it’s Svetlana Kuznetsova in straight sets! Saving break points when serving for the match, Kuznetsova hits a backhand winner on match point to beat Radwanska, 6-2 6-4. Hitting 37 winners to 20 unforced errors and holding up well on her second serve with 67% of points won behind it, that’s a fab win for Sveta! First Wimby quarter-finalist of 2017. 12:52pm: Muguruza holds to 3-2, saving another break point. The Spaniard was starting to look in trouble after a panic drop shot at 30-30 in a gruelling rally where Kerber never looked like missing. Kerber plays a drop shot on break point, but surprisingly misses the pass. Muguruza with a gorgeous backhand winner down-the-line to hold. Ostapenko is a set and a break up on Svitolina at 6-3 4-2! 12:47pm: Big hold for Ostapenko, smashing a backhand winner on break point to stay ahead on serve against Svitolina, 6-3 3-2*. 12:42pm: Muguruza seems to be losing confidence up at the net but I like her persistence with the tactic and she saves a break point to lead 2-1 second set. Her volleys are looking very careful and we know Kerber loves a target. It will be interesting to see if Muguruza can put some pressure on Kerber’s serve, which has surprisingly held up well so far. 12:28pm: Kerber wins the first set, 6-4, and arguably one of her best sets of the year. Kerber wins it on another sensational rally with a smash winner. Muguruza trying to be aggressive but not looking too convincing up at the net with Kerber on point with the passes. Loving the slices from Kerber too and she’s going DTL! 12:24pm: Rybarikova has won the last four games of the first set to take it, 6-4 over Martic. Kerber gets the first break against Muguruza and will serve for the first set at *5-4. Really enjoying Kerber-Muguruza so far, a tough ask it would seem for Muguruza to break through the defences of a ROCK SOLID, Kerber so far and decide when to come in! Passing shot winner on SP, Rybarikova back from a break down to win the last four games, 6-4 over Martic. 12:18pm: Kuznetsova wins the first set of the day, 6-2 over Radwanska. 18 winners to 9 unforced errors and sounds like a great start for Sveta! Svitolina’s coming back but a huge roar from Ostapenko to save break points and then hold to 5-3 first set. #Kuznetsova with a brilliant gameplan against #Radwanska (aggressive returns, work Aga's bh, dtl accelerations & more)..
12:14pm: Muguruza saves a break point with a nice backhand followed up with a volley winner to hold to 4-3. Muguruza gets a time violation but reacts positively. Kerber has been so, so solid so far, hitting a few passing shot winners and taking a few chances. Best i’ve seen Kerber in a longgg time. Still, a test now after missing that break point. 12:06pm: A really fab start to Kerber-Muguruza! Kerber taking a few chances, including a sweeeet backhand down-the-line, but Muguruza still the more aggressive and wins an important point at 2-2 *30-30 with a volley winner. Muguruza holds to 3-2. Ostapenko’s forehand is still lethal with Svitolina directing too much to that wing. Ostapenko on deuce again on her serve at *4-1. 11:59am: Ostapenko’s forehand is lethal right now and she comes through a deuce game on serve to lead 3-1 first set against Svitolina. Elsewhere, Kuznetsova is a double break up on Radwanska after the Polish player had game points in her opening service game. Out of last 9 points Sveta won – 8 winners. Only last one was Aga's missed lob. 11:57am: A good start to Muguruza-Kerber, going on serve with the Spaniard leading 2-1 first set. As expected, Muguruza is looking to come forward whenever the opportunity arises. 11:50am: Jelena Ostapenko consolidates an early break of serve to lead 2-0 vs. Elina Svitolina. Typically huge hitting early on from Jelena. Svetlana Kuznetsova and Petra Martic are also up an early break in their matches against Agnieszka Radwanska and Magdalena Rybarikova respectively. 11:35am: Here we go! The players are coming out on to court for the the first set of matches. Rybarikova and Martic are already warming up, no sign of Kerber and Muguruza yet on No.2 Court. 11:12am: Today’s schedule is a mad one with four women’s matches up first at 11:30am. At 13:00pm, the two women’s matches on Centre Court and No.1 Court will start so it is likely we will have six women’s matches going on at once. My plan is to start with Kerber-Muguruza and Svitolina-Ostapenko, and flicking to the others at key points! 11:00am: Thirty minutes to go! I am buzzing about these fourth round matches, so much so, that I have previewed all eight on the blog including bumper previews of Kerber vs. Muguruza and Halep vs. Azarenka with plenty of (hopefully) interesting stats. July 10, 2017 in Wimbledon, WTA. I don’t understand why all of the WTA matches start within a 2 hour period. They have all day, 8 hours +/-, to play with apparently no rain in sight. I believe there is a threat of showers although looking better than it did. Tomorrow though looks dreadful. The main reason I guess is because the women play QFs tomorrow. Still it’s never been this mad before, normally they mix it up a little with one of the women’s matches on CC or No.1 second up. I just love it like this! If the post Serena era will be like this, I have no problem. Just look at the quarter final match-ups, it’s still great. From here on out, barring injury or some ill fortune, the match-ups look great regardless of the possible permutations. Had Pliskova and Kvitova still been part of the draw, I would have loved them to be on opposite sides. Take Bookies favourite Konta, she will have to go through Halep, Venus or Ostapenko just to make the final, everyone has to earn their keep! I keep waiting for Ostapenko to go off the boil, but it isn’t happening. The Ost appears to be getting stronger with each match, as she overpowered the solid game of Svitolina. Yup I am proper impressed with The Ost. And I can’t wait for her next match vs. Venus. I think that both GS (RG and Wimby) have been really really really good (so far) given that lots of people were convinced it would be lame tourneys on the women side. Sorry, Murphy. I thought it was one of Angie’s best matches of the year, a very high level from both. What have you got against Kuznetsova?! I think shes probably been the most impressive player on the womens side this year! Though if Muguruza gets fired up, I fully expect her to win their QF. Konta had her hands full with Garcia, but the woman was unusually clutch towards the end of the third. So chill, well played. Those bookies must have spurred on her belief even more. Shame for Garcia, who I thought was the better player for most of the match. Her serving in the third set was flawless up until that weak approach shot to Jo’s backhand which brought up 30 all. She did very well. I was disappointed by the way she even fluffed that last point into the net, giving the break to Konta. She played well against the massive home support for Jo. Nothing to be ashamed of at all, even bested Mlads here. I’d love to see Magdaléna Rybáriková go on and win Wimbledon but that seems very unlikely. My pick to win is now Garbine Muguruza who has found her best form at the right time and has reached the final previously. Venus Williams v Jelena Ostapenko is the QF match that I want to watch the most. Calm experience against fiery youth – should be interesting ! My thoughts exactly, I recall how she calmly tamed the unstoppable form of Coco Van a few months back. Although Ostapenko may be too much of a wild child on the grass. Recalling Aga’s words about ‘the kids are coming’, I guess no one sent Venus the memo. Hope it is competitive.